Private functions, club gigs, tours or festival stages – the needs of the performing musician can vary as dramatically as the setting, but the desired result is always great sound – in the audience, and onstage. Whether you require a no-nonsense vocal PA for an acoustic gig in your local or a full concert sound system with engineers & stage crew, we provide the necessary specification of equipment and experienced personnel for your event. 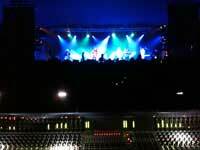 Drums, backline, and lighting hardware are also available from our hire stock. We have over 15 years' theatre experience working on everything from 2 hand shows to large productions. Our engineers have worked extensively within Glasgow and beyond. No matter the size of the production we aim to provide a customised professional and personal service. We understand the unique pressures and technical challenges of staging a successful show. Through continued investment in high quality equipment we ensure the unobtrusive reinforcement of the performance so that every line counts. 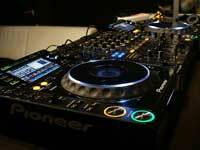 We make it possible to present your own club nights & other events. 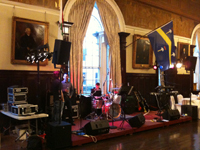 Bars, cafés & restaurants can often make for the ideal late-night, intimate gig, evening reception or aftershow party; but the day-time/background music systems sometimes installed in such venues are often unsuitable for DJ use. We provide premium quality audio systems delivering the low-bass demanded by House, Dub & Hip-Hop, and the high-end clarity needed for modern dance & electronica. We deliver the equipment and expertise to suit all venues; from bars & basements to full concert-specification systems for clubs and live music events. Give your set the sound it deserves. If you’re a wedding planner, or simply planning your own celebration, why not opt for a professional unobtrusive one-system solution for your stage? With the sound equipment set at an earlier (guest-free!) point in the day & a friendly engineer to take care of all technical eventualities, you can relax knowing it’s all in safe hands. We have an ever-increasing range of audio equipment at our disposal, and tailor each solution to the particular needs of you, the client. However, some examples of popular solutions are given below, as an illustration. Suitable for: Solo/acoustic performances in small venues, Open Mic nights, vocal presentations & music playback. Suitable for:	Music performance by bands requiring high-quality, full-range sound reinforcement (includes subwoofers and mic’ing of all inputs, inc. drums, guitars, basses etc) in venues where no suitable PA system exists. Suitable for:	Theatre productions, small festival/multi-artist club events, larger function bands requiring premium sound reinforcement & engineer; touring bands in smaller venues lacking suitable PA/Lights, where a complete system + engineer package is required. We also have a wide range of wireless mic equipment.